We stayed at John's condo for a little over a week in October 2015. I just can't say enough good things about the condo as well as John. The condo is very centrally located, just minutes from Kona downtown and about a 20 minute drive from the airport. It overlooks the coast and backs up to a golf course. The view of the coast from the condo is quite spectacular. It is close to a strip mall with a handful of restaurants, grocery store and a Longs Drugs. The condo is very well equipped with all the amenities listed and looks much much better than some of the pictures. The downstairs master bath is quite luxurious with double showerheads, a jacuzzi and double vanities. The upstairs bath is also quite nice with double showerheads and double vanities. The kitchen is well stocked with ample utensils, etc. The lanai that overlooks the coast is just wonderful for morning breakfasts and evening dinners. There are so many other things that the condo comes with that John doesn't advertise. For example: there's a large stash of beach toys, boogie boards and good quality snorkel equipment. We literally didn't have to rent anything -- this is quite nice because one of the BEST snorkeling spots is like 5 minutes away. It also comes with a high chair and some other stuff for kids. The condo is located on a very well maintained and nice property. There's 3 swimming pools with one of the pools that overlooks the coast. The lighted tennis courts are great as well - the club house rents out racquets at a very nominal fee. There's also a ping pong table by the pool and the club house with ping pong racquets available at a nominal fee. Any time we had an issue, John was very easy to get a hold of and very responsive. We've been to Hawaii multiple times but the time we spent at this condo was one of the best experiences ever. SPECTACULAR UNOBSTRUCTED OCEAN & GOLF VIEWS FROM YOUR PRIVATE LANAI! Spectacular vaulted ceilings and koa wood details. Two spacious bedrooms and additional loft bedroom. Master & guest bedrooms each with king bed. Large loft bedroom with two twins and one full bed. Three full bathrooms including en suite master bath. Master bath w/ double sinks & separate water closet. Stunning ocean & golf views from living rm. & lanai. Indoor and outdoor ocean view dining. Full kitchen with range, oven, micro and dishwasher. Complementary high speed internet access. Separate Adult Only Pool and Jacuzzi. Separate Clubhouse Pool & Jacuzzi. 18 hole golf course at Kona Country Club. Staffed club house including activities director. Kanaloa at Kona Resort is a prestigious 18 acre development on the Big Island's famous Kona Coast. Managed by Castle Resorts, the resort features stunning ocean vistas, well manicured gardens, and plenty of aloha! It is the perfect setting to enjoy Kona's 300+ days of sunshine a year! Your vacation home is extremely well located. Walk to the adjacent Harbor at Keauhou Bay where you can organize sport fishing, snorkeling, scuba diving, outrigger canoeing and sunset sails. You might also go snorkeling at Kahalu'u beach (thought by many to have the best snorkeling on the island) or go boogie boarding at White Sands Beach - both beaches are close by and feature lifeguards. Similarly, pampering can be found at the nearby Keauhou Sheraton's spa. Restaurants and shops are conveniently located just up the hill at Keauhou shopping center. These are also trips to Waipi'o Valley in the north for hiking and horseback riding; helicopter tours; hiking and viewing the active Kilauea Volcano in the south; and treks up Mauna Kea, a volcanic peak rising some 14,000 feet above sea level! Kanaloa is a short drive from the Kailua-Kona International airport at Keahole (KOA) which offers nonstop commercial service from Chicago, Denver, Los Angeles, Phoenix, San Francisco, Seattle, San Jose, along with direct inter-island flights from Maui, Kauai, and Oahu. We look forward to welcoming you and are certain you will have a great stay. Keywords: Spectacular Ocean, Sunset, and Golf Views! Spectacular Ocean and Sunset Views looking directly over the Golf Course. Upstairs loft sitting area with bedroom and full bathroom. We had a wonderful time in condo 1503! The view from the Lanai was fabulous, so that's where we hung out when we were not at one of the three pools or exploring the Big Island! The accommodations we're very nice, the owner was easy to work with, and we loved our stay! We highly recommend condo 1503! Awesome Place to Stay in Kona! This place was perfect for us. So spacious, comfortable beds, 3 full bathrooms. The deck overlooks the golf course and ocean - spectacular sunsets. We really appreciated that the kitchen had spices and condiments - stuff you don't want to buy if you're only there for a week. They had a cooler for use - again really convenient to go to the beach with. The fridge has an icemaker and the water is good to drink out of the tap - so no buying bottled water. We did not opt for the A/C and glad we didn't. There was enough breeze to keep things at a perfect temperature (we were there in Jan and daytime highs were +26 Celsius). We used the ping pong table, the tennis courts, and the pools & hot tubs on some of the days. Everything onsite was clean and well-maintained (except for maybe the ping pong racquets). There's a shopping centre within walking distance (1/2 mile away). It had grocery store, drug store, restaurants, ice cream, pub, clothing, etc.). The Manta Ray night snorkel (highly recommend - book through Sea Paradise) is within walking distance. A great beach for snorkeling and surfing is less than a mile away. We would definitely stay here again and recommend it to our friends. We really enjoyed our stay at Kanaloa. The resort itself is great its quiet, clean and staff our helpful. Very relaxing time spent at the condo. Pools were nice always room to sit and not crowded at all. The condo itself if spacious and loved the lanai. Our family of 8 had a great week at Aloha condos. John provided everything you can imagine in the condo to make our stay better. We especially loved the Lanai with it's great view of the golf course and ocean.Spent much of our time there when not sight seeing or at the beach or pool.Great location. Easy to get around and lots to do.Thanks John for a great time on the Big Island! Three golfers in for a week. The location was perfect for us, close to grocery shopping, and quick to get on the road to get to courses. 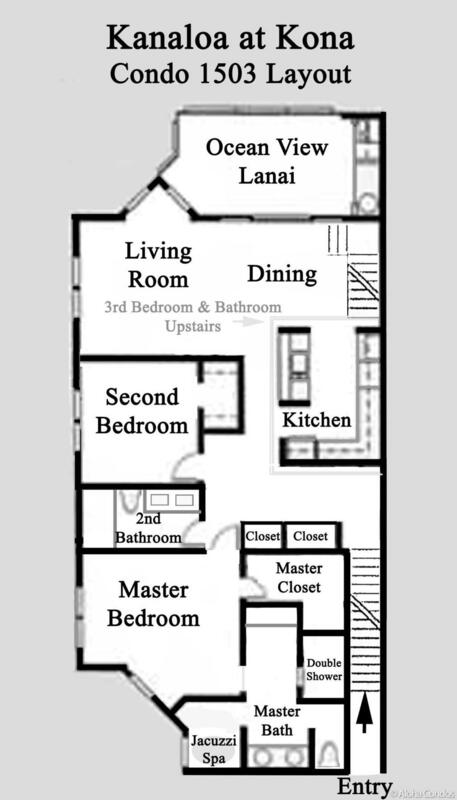 Floor plan was spacious and had nice second floor deck with beautiful view of coast to the north and west. Also close to snorkeling and water activities. We opted for the A/C as we wanted the cool nights to sleep. It worked great as central air, not small plug in units. Definitely would use this unit again next year. What relaxing trip my party had. The condo fit our needs perfect and the lanai view was the best! Thanks for the welcome basket too! Great place to stay....everything supplied and both John Bishop and Brandon were wonderful and so helpful. I would recommend anyone visiting Kona to stay at this condo. Thanks again for making our visit to the Big Island enjoyable. The condo was very large and comfortable. It was well stocked with kitchen essentials and towels. There was a really nice amount of beach supplies. The view from the lanai was very lovely. We stayed in John's condo 1503 and it was perfect for a family needing 3 bedrooms (our config was x2 couples & x1 15 year old), the x3 bathrooms and toilets came in very handy. Great location and close to shops (4min drive or approx. 20min walk). Air con, fans, tv, wifi etc.. all amenities working in great order. View over the golf course and ocean was truly beautiful and watching the sunset at night made for an outstanding holiday. I would definitely recommend. PS if you get inside condo first make sure you get the master bedroom with double shower head en-suit!! The Condo and layout of the condo was perfect. We had a great view of the ocean looking toward Kona. The unit was very clean and comfortable. The kitchen was well supplied for cooking needs, except the toaster did not work. We used the oven to toast our bread with. We could of used more trash can bags. The decor need a little help but as a professional interior designer, I notice things other people wouldn't notice. The TV's were very difficult to work and did not work some of the times. It would of been nice if the whole house fan worked and for the ceiling fan in the loft to work. These items need to be fixed. The grounds and pools were fantastic, the complex was beautiful. Staff was friendly and getting in and out of the complex was very easy. The location was perfect. As far as visiting again I would. It is on my list for return possibilities. My husband, our two adult children, and I enjoyed the condo very much on our recent 2 week vacation. The view of the ocean and the golf course from the lanai is wonderful! Condo has not been updated but is still clean, comfortable, and nicely stocked with everything you need for a home away from home. The welcome basket of fruit, jams, and Kona coffee was especially nice. As well as plenty of beach towels and other beach items to use. We did have an issue at first with the internet but called the condo service contact and he helped us remedy it right away. No issues the remainder of the trip with internet or anything else. Definitely would recommend this condo. Great value for a 3bed/3bath place and in a great location and in a safe and nice complex. Aloha from Germany,without many words: we were a party of five and everything was as described and expected, so we had a great time.Mahalo! We had a relaxing and comfortable stay in unit 1503. The unit faces the golf course with the ocean at the edges. When the breeze picked up, it flowed nicely through the unit cooling all of the rooms. We have stayed at the Kanaloa many times over the years and this was one of the better units and one we would certainly request again of future visits. This is a great location. Condo is well stocked for cooking and BBQ is nice and close. Walking to shopping, to the Sheraton day or night was lovely! We enjoyed our stay at Condo 1503! We wanted to be in a quiet area away from town. The condo is in a quiet, gated area that was easy to get to from the airport, close to the grocery store, and easy to get into town and other attractions on the island. The condo is very spacious and has a spectacular view from the lanai! The beds were comfortable, huge master shower and bathroom, the kitchen had everything we needed, beach towels and washer and dryer also in the condo. It was nice to have a designated parking space. We were out exploring the island most of the time so did not use the pool, tennis or golf course there. The owner was very quick responding to any questions and had a lovely gift basket of fresh fruits, local honey and jams upon our arrival. Check in and check out process very smooth as well. Mahalo!! I would definitely recommend this condo. It was clean and well stocked with lots of linens and dishes. It has a great ocean and golf course view so is very entertaining. You can watch for whales, dolphins, boaters or golfers teeing off.The layout was perfect for our family with the loft having its own bathroom upstairs.Our only complaint was the internet access. The user name provided for us to connect to didn't exist and we ended up connecting to an unsecured one.We have stayed at the Kanaloa a few times before this visit and love the location and facilities.We would definitely stay in this unit again.Thank you for renting us your condo. We really enjoyed ourselves. We had a great stay at condo # 1503 right on the ocean and the golf course hole #11. What a great view!It was very comfortable and plenty of room with a lot of necessities provided including beach towels, snorkeling gear, books and movies.We would stay with them again. Just stayed at this condo. Had a great time.Condo was well stocked. With regards to previous reviews about condo, yes, it could use updating. My house does too! It didn't prevent use from having a good time. It was so nice to sit on lanai in the AM drinking coffee and watching golfers and waves crashing on rocks. It had been very humid lately and really needed the a/c and fans upstairs. Beds were very comfortable. Thank you for the lovely basket. My only big complaint was the internet, or lack of it. Had it off and on 1st day, after that couldn't get anything. Don't know if it was the providers poor service/location. Was able to get service at main pool. So if internet is important to you this might not be a good choice. If you don't mind going to pool area to work, beautiful views, crashing waves very distracting !! What a great condo. Everything from the fantastic view from the lanai, the comfortable beds, the great kitchen with everything you could need and so much more. We all thoroughly loved this place. When we first walked into the condo and "explored" what there was, we were all totally impressed. My in-laws, who were with us thanked me for getting such a great place. We had no problems at all and the grounds, pools etc. were great. We recently spent five nights in the condo. I was disappointed upon my evening arrival when all of the the outside lights guiding a guest to the right condo were off. Without a flashlight we'd have never found the right door. Secondly, the large jacuzzi tub was not usable. It was very disappointing as this was a motivator in the rental. The jets were taped and the spicket for the water was taken off. Just having the use of the tub would have been nice. This was not indicated when I rented it. There were only four set of towels in each of the three bathrooms. This warranted multiple washing of towels throughout our stay. However, I was thankful for the beach towels and the beach mats, and snorkel gear. The view was amazing from the lanai and the large outside table is great. The rice pot is missing its cover making it unusable and the kitchen supplies were adequate. There are no frills here. Thank you for the fruit basket!! Guest parking was very far from this condo and the rubbish area was also far. There is an odor when you open your car door of nearby sewage treatment plant.We made sure to have all beds stripped and the towels in the washer when we left and respect the "No shoes" policy but the carpet could use a shampooing as I suspect that others did not respect that rule. Our feet got dirty walking in the condo. The air-conditioning needs balancing as some rooms were much colder than others. We spent little time in the condo as we enjoyed the beautiful beaches on the island. First it was obvious the unit needs updating. While a great location in the Kanaloa's, this plus was more than offset by the aged condition of the unit. Never could get the Chase wireless to work, so basically was with no service during our stay. My wife could not take a bath as the master bath tub was out of order, and the guest bath was to small and oldfor her to conveniently use. You could tell that things in the unit were fixed rather than replaced or updated, from lighting to simple things like the coffee maker. We have stayed at the Kanaloa for many years and the majority of the units we have rented have been very nice and up to date. This is not one of those units. Unit 1503 was a wonderful unit! It was great to have all the extra stuff available for use, snorkle equipment, surf boards, etc. We will definitely be renting this unit in the future. Thanks, Dan. This condo was perfect for our family of 6! Having three bathrooms and the loft area upstairs was terrific! We were able to all come together and then have separate space when we wanted. My teenage boys loved having their own "area" and not having to share a bed like in a hotel. The sunset views were amazing! The pools were great- we spent most of the time at the Ocean pool. The lanai was comfortable and well equipped with beach gear and other items should you need them. The only issue I had was the mosquitos. Even with the citronella candles and bug spray, they were out for blood! This is mother nature though and not any fault of the owner. They had items to help. The condo was well equipped with anything you may need in the kitchen and bathrooms. It was so nice! We went to the grocery store right up the road often and cooked just like we were home. I must also say that the condo was SPOTLESS! It was very clean and it was great having a washer/dryer right in the unit to wash clothes/towels. Location was convenient and communication prior was on point! We would definitely stay here again. Thank you to the Bishops! Your wonderful home was perfect for us to make memories that will last a lifetime! Mahalo, Shawn and Bonnie and am glad you had a nice vacation. Your deposit was never charged it is only a hold that is released automatically. It is fed into the system and am not quite sure of the time frame. We had a great time. Very nice condo. Welcome basket was amazing, full of local fruits and goods. Superb view from lanai. Only downside, not walking distance to anywhere. Mahalo! We thoroughly enjoyed our stay in this beautiful, spacious condo with a great view of the golf course and ocean. The area is quiet and just what we needed to get some rest and relaxation. The location is great and not far from the market and Kailua. The entry to the condo is at ground level but there is a flight of stairs to get to the first floor main level upon entry, which was unexpected. Would highly recommend this condo and will definitely visit again. This was a great place to stay for our group of 7! It is a beautifully decorated and cozy place with private spaces as well as shared spaces. It was great to be able to have 3 of us stay upstairs and have our own bathroom while the older folks stayed downstairs and had their own rooms and bathrooms as well. The kitchen was terrific for cooking meals and we enjoyed both eating in the living room as well as outside on the lanai. We staying for 9 nights and enjoyed it very very very much. The condo complex is also very nice - three pools and hot tubs to choose from as well as BBQs. And this condo in particular has a great view of the ocean and overlooks a golf course, so feels extra private and quiet. The location was convenient for getting to all sorts of things as we frequently went both south towards Captain Cook and also north towards Waikoloa. One of the members of our group uses a wheelchair most of the time and had a hard time getting up and down the interior flight of stairs. We could not tell from the property listing that there were interior stairs, so we were somewhat surprised by this when we arrived, but he was able to make it work. Thank you for the opportunity to stay at this condo and make it our home while we were on the Big Island! We stayed four nights in this huge and welcoming Condo on the beach. So spacious and well equipped. So surprised to receive a welcome basket with delicious local delights. It is near everything and we used this as our home during day trips to all the local attractions. A nearby grocery store made it easy to stock up on supplies and we enjoyed some of our meals on the huge patio overlooking the ocean. Our adult son enjoyed the separate upstairs quarters and our other son and daughter in law shared the second bedroom. The master bedroom has a huge spa bathroom. It was great to come back to cold air conditioning after a day sightseeing in muggy August. We also enjoyed the pool that overlooked the ocean-swimming while waves crashed on the rocks. Would highly recommend this spot. Only concern was that it took awhile to get our deposit back but that was quickly resolved once we asked. It's even better than the pictures! We enjoy staying at Konaloa at Kona, the facility is always quiet and is a great location for water sports.This was our first time at condo 1503. With a large 3 bedroom, 3 baths layout it fit our needs for 7. The unit was clean and well furnished with everything you need for your stay from beach chairs, snorkel gear and kitchen supplies. A nice fruit gift pack was on the table when we arrived. The 6 days went well. The condo has seen better days and is in need of fresh paint and repair. I feel we should have been notified in advance that the tub in the master bathroom has been out of service. The stove had 1 burner out of service and the tag stated that they were thinking about replacing the stove. The refrigerator water dispenser did not work. 3 of the 6 dining room chairs seats were ripped or falling apart.There are numerous switches for fans and lights throughout that did not work or we could not figure it out. Labels would be nice. Never did get the lanai fan or main light to work. The condo was spacious, and the view was fantastic. There were a few things that were not working, a fan, and some lights. Was very excited to see a large bath tub in the master bath, but it was not working. The tub is not listed, I just hope you guys get it fixed soon. Everyone loves a jetted tub! Besides a few things not working, this condo is great. We all had comfortable beds, and plenty of space to hang out after being in the water and sun all day. We felt at home and comfortable there. The beds were comfortable. The AC was easy to figure out. The master bathroom, and shower are huge. The grounds are kept up perfectly and the pools are fantastic! Great condo! Quiet, and spacious. We walked in to a welcome basket that contained a selection of local items, which was a nice surprise! The view was wonderful! The condo has plenty of room for more than our small group. It really could sleep eight if necessary. The only draw backs are that the bed upstairs is so hard that it is not acceptable. It truly hurt. There were also three large cockroaches, but they are all over the island. We had a seamless check in, and the staff was great. We had a medical issue that involved the hospital and had to check out an hour late and were given very thoughtful consideration. All in all, a wonderful place to stay! PROSLanai looks out on golf course and ocean. You are close enough to the ocean to hear the waves crashing. Three pools in the complex, one with ocean/sunset view. Well stocked kitchen with most pots/pans, herbs/spices, condiments you could need. Lots of pool/beach toys, and two coolers. Quiet washer and dryer.Great location in Keauhou area only 5 minute drive from Kahaluu Beach which has great snorkeling. Quiet at night (no loud parties to keep you from sleeping).15 minute drive from downtown Kona tourist attractions and Kona food shopping (Safeway, Walmart, Costco, Target, etc...).35 minute drive from two step beach (highly recommend). CONSUpon opening the door, you have to walk up about 20 stairs.Condo has louvered windows so condo is not well sealed from the elements. While there are ceiling fans in most rooms, the temperature is at or above the outside temperature without A/C on.Given that it is on the second and third story of the building and not well sealed, without A/C (which you have to pay extra for, which is disappointing), it would have been unbearable to stay there or especially sleep there.Felt nickeled and dimed by the A/C fee and the fee/person.After including these fees, it would have been as cheap to stay at a Waikoloa resort.Many of the beds are old and hard and caused back pain in the morning.The condo is probably 40 years old and many aspects need updating.Indoor jetted tub is broken.They had more VCR tapes than DVDs (only one of which was worth watching).Can be noisy during the day between the gardeners in the complex and the golf course. Everything was nice and clean, very much as advertised. The only thing that I would say that was unexpected was in the main pool, some people who I assume to be full time residents were a bit too sensitive in calling security about kids playing. I myself am very sensitive to other people nearby, etc. but security was called for them playing a game in the pool. A bit lame as if they were that offended they could have simply asked, but I can assure you they were not being loud. Perhaps just people who didn't care for having kids nearby. Otherwise, everything about the condo was good, people onsite friendly, and location/view was better than most in the condo. The place is nice and big, was large enough for the 2 families we had there. Parking is limited to one space and the other open parking is close enough not to be concerned, but would be nice if there were 2 spots given the size of the place. We very much enjoyed our stay at the condo. The fruit basket and jellys were delicious and came in handy because our flight came in so late that we were starving in the morning. The condo is huge - much larger than we had anticipated. Amenities are all as expected or better. The grounds crews are at work all day long making the surroundings beautiful. I can't believe how hard they work. I loved that there is an ocean view from the kitchen so I could enjoy it while cooking. An added perk is that the neighbor downstairs is really nice. We walked out on the golf course every night to enjoy the sunset. Location wise was very nice. The floor plan was very functional. The negatives would be fixtures and countertops. The ceramic countertops throughout really punctuated the 25 years plus age of the unit. Many other units, like 3304 with updates, really magnified the shortcomings of 1503. Some nice tile work in the bathrooms and granite throughout would really help to pull this unit up to a level necessary to receive that fifth star. We have been renting homes through direct owner sites for years all over the world, and this one is outstanding, The condo was very well-appointed--as though we were coming into someone's home to live. From the balcony we were treated to a view of the ocean and the rocky shore line. Although it is listed as a partial ocean view, it felt very private. The condos were built so there is very little noise coming from adjoining properties. When there were breezes coming off the ocean, we opened the patio doors and cooled the first floor bedrooms. Ceiling fans in all the rooms helped cool the condo, but there were a few days when we were grateful for the air conditioning. The kitchen was supplied with many condiments for our use, including some local staples such as soy sauce and fish sauce. There was a welcome basket of local organic fruit and preserves on the dining table to enjoy. The cooking utensils were above average (with the exception of the knives--but I am an unabashed cooking knife snob). We appreciated that the Bishops provided sufficient beach towels and beach gear for our use. And the linens and a bath towels were above average as well.There was plenty of seating on the patio for our combined party of seven adults and two children to share meals together (five adults stayed in the condo; a family of four joined us for several meals at the condo). Shopping and shore access were within easy walking distance. The complex had three lovely pools, including one for adults only, and a golf course was outside our balcony. The only caveat I would add. There is an upstairs bedroom/loft with a bath and a double bed. This room had no outside vent, so it was dark and rather claustrophobic. It also was difficult to cool unless you left the whole house fan on all the time,which was too noisy at night for sleeping up there. Two of the four nights we had a fifth guest staying with us, we had to leave the air conditioning on all night. The Kanaloa at Kona location is excellent. The gardens are colourful and highway noise non existent. Unit 1503 has a good view of the ocean. It is also very spacious and accomodating.Amenities are within walking distance. We enjoyed our stay. This condo was excellent in every way. For our family of four it was a great size. Mater bedroom was huge with a great ensuite bath, second bedroom also large and the upstairs loft with seating area, bedroom and ensuite bath gave my son the feeling of having his own condo while we were there!.Condo was spotless when we got there, all dishes/utensils/pots and pans etc needed in kitchen were available, and a nice large, open living and dining room area was perfect for meals and relaxing later in the evening.The large lanai was fantastic and the views of the property and ocean from it were spectacular. Having access to the on site pools was an added bonus, and there are tennis courts and ping pong table available as well. Overall an excellent unit, and I would not hesitate to stay here again, or to recommend it to anyone considering a stay in the Kona area of the Big Island. Great location, pools, views, and accommodations. We were there for 7 nights and had activities planned all day and evening. Easy to get around but so nice to get back and sit on lanai and read or just relax. We stayed at John's condo for a little over a week in October 2015. I just can't say enough good things about the condo as well as John. The condo is very centrally located, just minutes from Kona downtown and about a 20 minute drive from the airport. It overlooks the coast and backs up to a golf course. The view of the coast from the condo is quite spectacular. It is close to a strip mall with a handful of restaurants, grocery store and a Longs Drugs. The condo is very well equipped with all the amenities listed and looks much much better than some of the pictures. The downstairs master bath is quite luxurious with double showerheads, a jacuzzi and double vanities. The upstairs bath is also quite nice with double showerheads and double vanities. The kitchen is well stocked with ample utensils, etc. The lanai that overlooks the coast is just wonderful for morning breakfasts and evening dinners. There are so many other things that the condo comes with that John doesn't advertise. For example: there's a large stash of beach toys, boogie boards and good quality snorkel equipment. We literally didn't have to rent anything -- this is quite nice because one of the BEST snorkeling spots is like 5 minutes away. It also comes with a high chair and some other stuff for kids. The condo is located on a very well maintained and nice property. There's 3 swimming pools with one of the pools that overlooks the coast. The lighted tennis courts are great as well - the club house rents out racquets at a very nominal fee. There's also a ping pong table by the pool and the club house with ping pong racquets available at a nominal fee. Any time we had an issue, John was very easy to get a hold of and very responsive. We've been to Hawaii multiple times but the time we spent at this condo was one of the best experiences ever. If you want a fantastic view of a golf course, sea breezes, a clean and beautiful condo, then Kanaloa 1503 is for you. We would definitely rent this unit every year. Management is attentive and has a good spirit of aloha.Cheers!